TweetBe.at is an instant messenger and chat client for Twitter users. Hashtags are used to tag you to a Twitter channel. TweetBe.at uses Twitter API for authentication. Once authenticated, you can join any channel you wish and start tweeting. 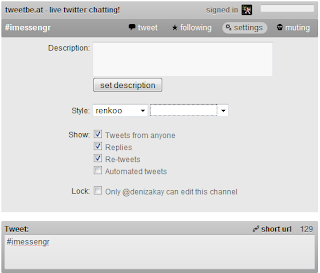 You can even create your own channels and ask all your twitter friends to join the discussion. You can save searches, track the various channels created, add Twitter friends you wish to follow on a particular channel. You can hide tweets containing words or phrases you aren't interested in.